This simple White LED lamp can be used in areas where little light is needed. It uses a High bright white LED and its brightness depends on the ambient light in the room. In dark, it give maximum light and in light it switches off. If the light intensity is low, it gives moderate light. 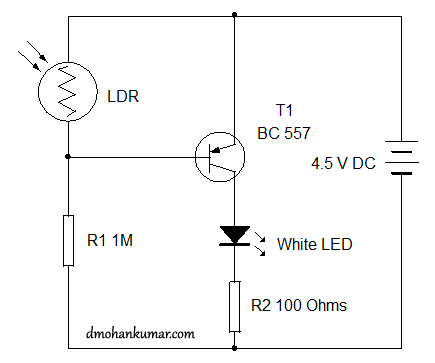 An LDR and a PNP transistor act as a switch to control the brightness of the LED. Current flowing through the LDR depends on the intensity of light falling on it. If the day light is maximum, LDR conducts fully and keeps the base of the PNP transistor T1 high. This makes T1 off. In dark, LDR offers higher resistance and the base of T1 will be grounded and it forward bias to light the LED. Thus depending on the base current to T1, the collector-emitter current of T1 varies and thus the brightness of LED. Change the value of R1 for experimentation to get maximum result.